Ed Asner is one of the most honored actors in the history of television. Asner is best known for his comedic and dramatic crossover as the gruff but softhearted journalist Lou Grant, the role he originated on the landmark TV newsroom comedy The Mary Tyler Moore Show. Lou Grant's story continued in the newspaper-set drama Lou Grant, which earned Asner five Emmys and three Golden Globe Awards. Asner received two more Emmy and Golden Globe Awards for the mini-series Rich Man, Poor Man and Roots. Most recently, he voiced Carl Fredricksen in the Disney Pixar animated film Up. He has also recently appeared in shows like Royal Pains, Hot in Cleveland, Hawaii Five-0 and Law & Order: SVU, among others. 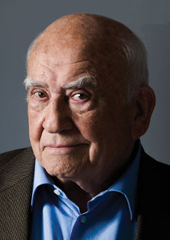 A passionate and informed spokesperson for the causes, Asner is a frequent speaker on labor issues and an ally for some of the acting industry's older artists.